This is a slice of the information gathered in the survey I posted about last week, and the data I found most useful and surprising. As someone who writes a series these are two issues I struggle with in each new book. How much backtracking do I have to do? Can I assume that anyone picking up #4 has read 1, 2, and 3? And can I talk about what happened in the first book in the third? Based on this, I feel more confident writing my books the way I want to write them. 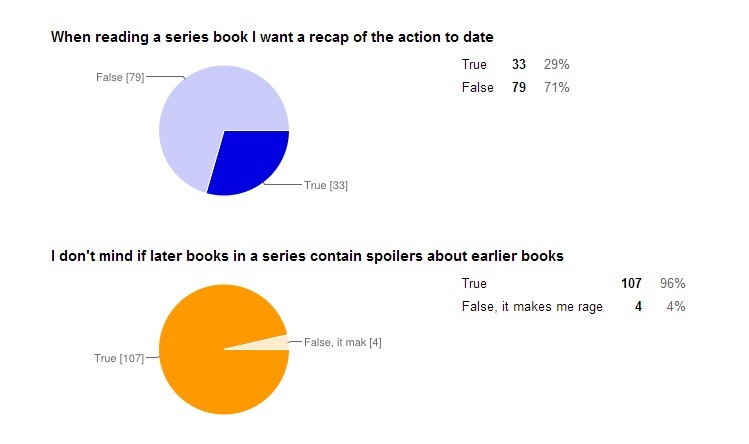 You can check out the full results of the “How Do You Like Your Books” survey here.